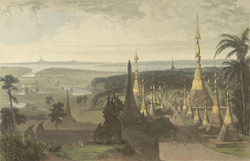 This aquatint was made from plate 2 of 'Views in the Burman Empire' by Captain James Kershaw. This view was taken midway between Rangoon and its celebrated monument, the Shwedagon Pagoda. The British troops occupied this road, having taken Rangoon in 1824 on their advance into Burma. Kershaw wrote: "Nothing can exceed the beauty of a ramble on this road, where at every step the eye is presented with continual changes in the size and the construction of numerous Pagodas which flank each side ... the whole being beautifully shaded with all the richness of Eastern foliage and the faintest breeze being responded to by the tinkling of innumerable small bells, so suspended to the tee, or crown work of the pagoda, as to vibrate with the lightest air." In the distance, the river turns to the sea, "to which point our eyes were so frequently directed to discover the first approach of the ships, on the arrival of which so many of our comforts depended".